Lita Ford doesn’t have to prove anything to anyone. She’s been playing guitar professionally since she was a teenager, and while she’s partied as hard as any Rock Star, Ford has kept her private life private, raised a family and still managed to maintain a high level of respect in the rock community for her skillful musicianship, which was never compromised by the fact that she’s also a beautiful woman. I remember reviewing her Greatest Hits Live CD when it was released in 2000 and being so blown away by what a great performer she is and how much fun she and her band seem to be having on stage. She’s never lost sight of what it means to have a Rock & Roll heart, and you have to respect that. So many performers could learn a few lessons on how to rock from Lita Ford. Maybe she’s never been a household name, but when she comes around, people take notice. Lita’s new album, the autobiographical Living Like a Runaway, signals that it’s time to start paying attention again. These ten songs tell Lita’s life story, from achieving fame at an early age, having a successful career in the era of MTV video stars, to motherhood and her recent (apparently messy) divorce. Working with producer and respected rock guitarist Gary Hoey, Lita sticks to her roots of making an album based on strong song writing (Hoey and lyricist Michael Dan Ehmig are contributing songwriters), guitar, bass, drums and passionate vocals that don’t sound like they came from a can. The album kicks off with the high energy “Branded” and never lets up, delivering Old School heavy rock energy and hooks sharp enough to sharp blood. On the title track, a Bryan Adams-esque ballad that compels with its deeply personal lyrics and memorable melody, Lita looks back on her time in the now legendary teenage all-girl rock band The Runaways, a band that launched not only her career but also that of Joan Jett. That was a long time ago, but Ford makes the experience sound like it just happened yesterday. In promotional material Lita reveals that after seeing a documentary about Pink Floyd’s Dark Side of the Moon, she was motivated and inspired to focus on creating Living Like a Runaway as a complete journey rather just than a bunch of individual songs. The effort has paid off, in that this album recalls the experience of listening to an album from start to finish as you retreated to your teenage bedroom, gatefold cover open in front of you, pouring over every lyric and instinctively moving your body to the rhythm of the rock. There are so many great songs on this disc, but my favorites are the aforementioned “Branded,” “Hate,” “The Mask” (which rocks with a slightly industrial feel) and the passionate, frenetic “Relentless”, but if you like real rock and roll, you’ll dig every song. 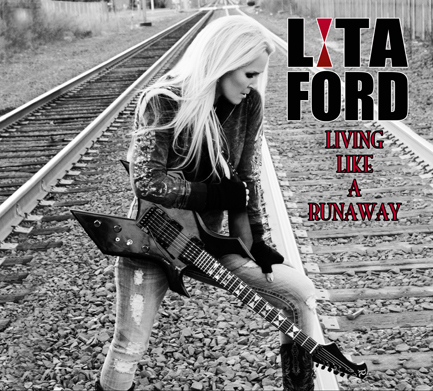 Living Like a Runaway is Lita Ford’s strongest, most accomplished album to date. Like oxygen in a vacuum, this album is very highly recommended for fans of song-based, melodic hard rock featuring expert guitar work. Who would imagine that such a thing would be so hard to come by these days? Living Like A Runaway will be released June 19th, 2012 in North America via SPV/Steamhammer. The album will be available in four configurations: a double LP, limited edition CD, standard CD and digital download. Living Like A Runaway is available for pre-order on Amazon Dot Com. Don’t hold back, Gail. Be more specific. I’m still not quite sure how you feel about this record. (LOL!) Thanks for sharing. Nice review. I’ll have to check it out sometime! Lita and the Runaways really did break ground back in the day. I always respected them for getting out there and making their mark. I had the pleasure of briefly meeting Lita a couple of years ago – she was a really sweet, friendly person. Hope this record sells big – she deserves the success.